Christmas is round the corner! If you still have to get something special for someone (including yourself!) here’s our no stress Christmas deal! Have a great time sipping premium coffee and support the farmers. That’s more than 200 Caffè del Doge espresso shots (not just any coffee), at a ridiculous price. Do the math. Whaaat? Free delivery available in some areas in Scotland too. We all get generous at Christmas time. Email us at sales@vquality.co.uk or use our Contact form to discuss what coffee is for you and arrange delivery. Human to human interaction, at your convenience. Another tick on your list and one less trip to the shops. Below is the best grinder around, in our opinion. The new features make it unique. It could seem complex to some but they made it perfect and simple for you. -> A radio waves based system (ever heard of RFID?) will automatically recognise if you need a single or the double espresso dose. When technology improves our work and saves us time and effort, ah! The best coffee would be ruined by poor grinding. Fiorenzato grinders have micrometric precision and all the sensors you need to focus on the most important thing: your cup of coffee. Proud distributors of Fiorenzato grinders in the UK. There are different opinions on what well-being is and what it is healthy. For us the main contributor to health is food. Good food means good health. Eating well has also different meanings to different people. In our opinion, it doesn’t necessarily mean avoiding certain kinds of food like pasta or meat. Good food is genuine, artisanal, with no artificial ingredients. Eating well to us is varying the good food you eat everyday. The key here though is finding the good food. There is the place in Glasgow where you will find the good food everyday, and everyday different and varied, not only in terms of nutrient but also cuisine. East meets West in ETC. One day lunch special could be Italian meatball panini, the next day an authentic Thai dish. You will find food that you might have not tasted before (have you tried their Sicilian arancini? Yum), and enjoy some familiar food: everything made with selected ingredients, fresh every day. They even make their sausages! From the oil to the flour to the butter to the cheese; from A to Z, everything is the best quality and expressed at its best with great cooking. The variety of cakes is superb, with some fixed choices like brownies, caramel shortcake or almond and blueberry cake, and some maybe especially baked for the day. For those looking for gluten free treats, they often make gluten free or vegan cakes, and their hot chocolate is also gluten free in a classic, chilli or amaretto flavour. Whatever good food means to you, We are pretty sure you will find it in E.T.C. Cafe. Superb variety of cakes in E.T.C. cafe. Homemade, fresh, everyday. No tricks no frills, just GOOD FOOD. To make it even better, you can get some of that for home. Handmade croissants and bread (like you’ve never had before *. *), Danish pastries, donuts, ETC! You can also have a great cake made for your celebrations. Check out E.T.C. Cafe facebook page for some photos, they look amazing! The Italian Aperitivo lands in Edinburgh! Aperitivo is not just having a drink before dinner. Actually the real Italian aperitivo includes a generous buffet table and a good amount of chatting with friends and new people. Aperitivo is having a drink and food before having more food and maybe a glass of wine- ah, the Italians! – but in a casual way, sometimes just after work before we go home for dinner, to catch up with friends and meet new ones. For us – coming from Lombardy, region of Italy, where aperitivo is a big thing, to end (or start, or break) the week in a relaxed hence buzzy athmosphere, with a choice of food and a good drink – this is great news! We miss aperitivo and are excited that Ristorante Isola (check out their Facebook page) is bringing Italian Aperitivo in Scotland. We have already been delighted by the sublime dishes served in this Edinburgh little gem, with Sardinian specialities (unique in Edinburgh) using the freshest ingredients, everything prepared fresh. We would recommend this place every day and for any occasion. As we say in Italy, class is no water. Need or want to change your coffee machine but don’t have much money to invest? Just one more reason to contact us and find out what we can do for you! We are super excited to announce that in exactly a month we will exhibit in the Scottish Coffee Festival. The festival has been organised by Chris Brown. We think he couldn’t have thought of a better combination of winning forces. 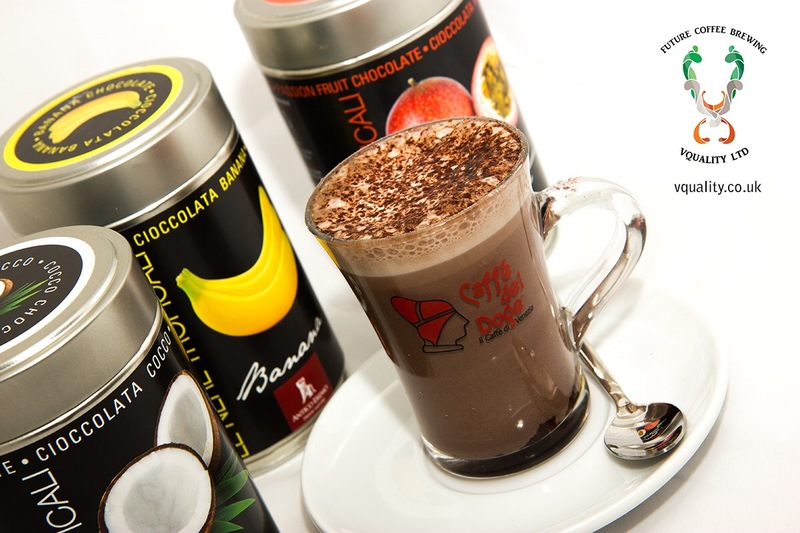 COFFEE The interest in coffee in all its aromas is growing at a great rate in the UK. People are not just looking for a generic cup of coffee anymore, they want to know where it comes from, taste it accurately, try different tastes and know more about how it’s done. It’s the perfect moment for an event like this one. SCOTLAND Aye! This is the Scottish Coffee Festival. GLASGOW We think like Chris that in all Scotland Glasgow is the perfect place for a Coffee Festival. That’s where we concentrate our business and where people are more receptive to events, big coffee scene, exciting and energetic. CHARITY What’s best than having a great time and doing good at the same time? And having a great time for a good cause while tasting coffee? Tickets are only £8 for a whole day filled with entertainment, specialty coffee and even more to eat and drink. 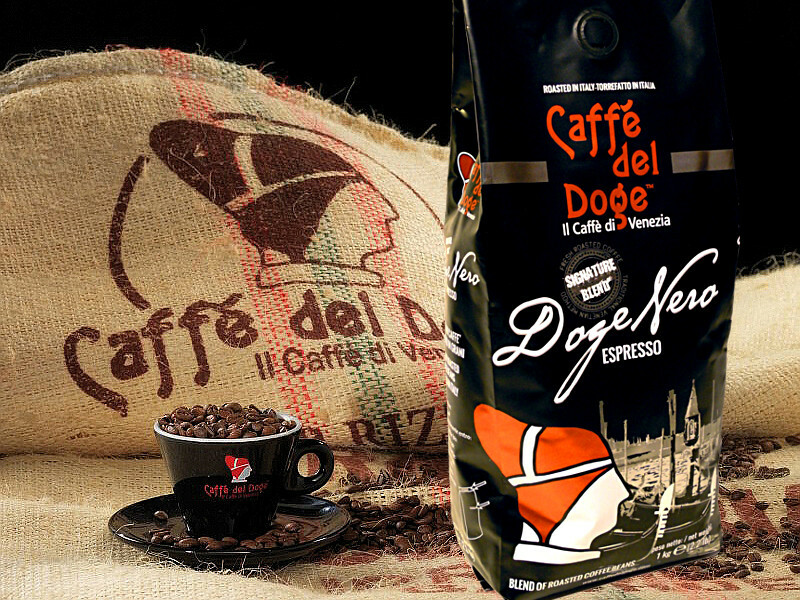 Our roaster Caffe’ del Doge has been member of the Cup of Excellence since 2004. The Cup of excellence is a yearly competition where select cuppers choose the best coffee beans. Bernardo at Caffe’ del Doge purchases winning beans every year, and winning farmers are greatly supported. BREWERY Informal but such cool places breweries are! and Drygate Brewery is very very cool. We met Chris last night and he’s been great, we are sure it will be a success. Thanks Chris! We’ll be there with a choice of different blends and we are working on the whole experience in this right moment! Stay tuned because we will be posting updates till the big day. Our coffee, roasted in Venice following the traditional Venetian method, is like you’ve never had before! Go check the festival website for more information and to get your tickets now, 29th of November is just a month away! The Little Cafe: Grand Gourmet and Cuba in Glasgow! The Little Cafe has a lot inside! In its spacious and clean interior well lit by big windows, tables outside and the Kelvingrove museum as a view, you can taste delicious food (the best pizza we’ve ever had in the whole country, just like we italians love it, and for the price of a cafe!) and our Rialto Gran Gourmet Coffee or if you feel adventurous a magnificent single origin: CUBA! Cuba is 100% Arabica, which means sweeter taste, many can drink it even without sugar, and as all our coffee is supplied directly and fresh by our roaster Caffe Del Doge in Venice. All beans are traced and Cuba in particular is a selection of the CUP OF EXCELLENCE. You better be quick because it’s going fast! Rialto Gran Gourmet has a great personality, intense aromas which combines well with milk in a nice cappuccino perfectly foamed by the amazing guys at The Little Cafe. The beans are roasted and then cold blended according to the Venetian methods. Nothing can deceive expectations at The Little Cafe, be it food, drinks, service, location or comfort. 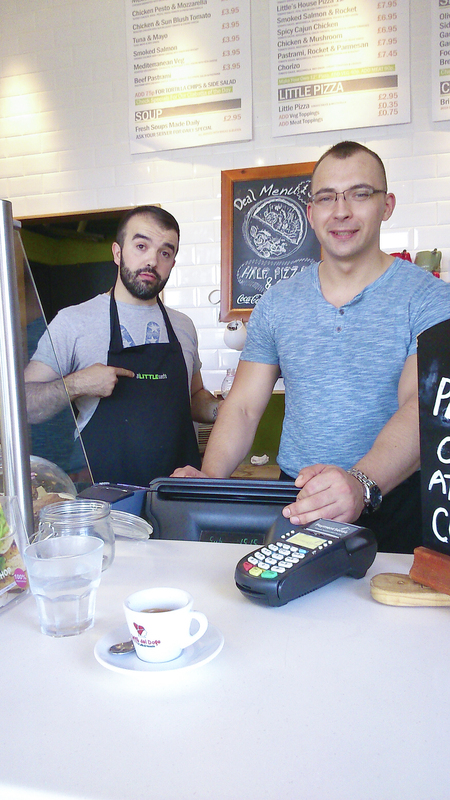 All staff is friendly, smiling, helpful and knowledgeable, and this guys know how to make italian coffee and food. Finally! Grazie guys for being the place that makes us feel home.